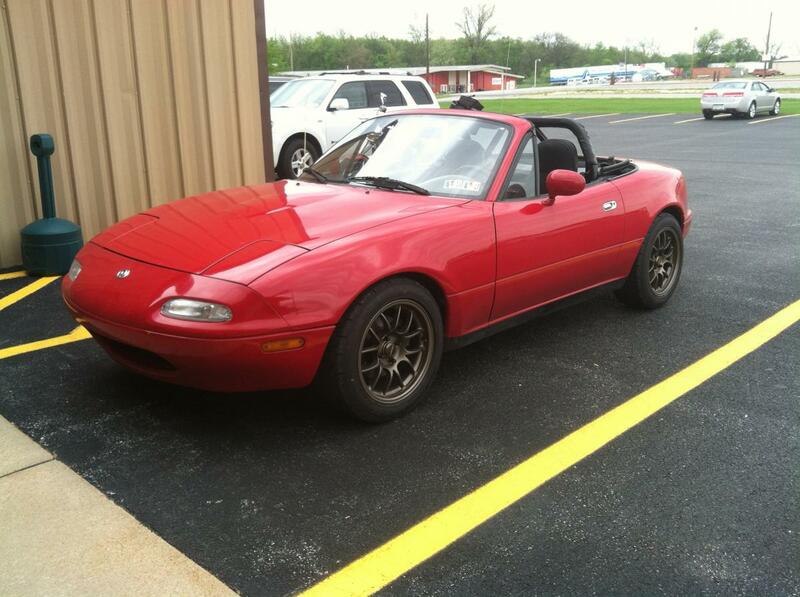 RedCarmel's copycat build - Miata Turbo Forum - Boost cars, acquire cats. Alright, today seems as good as any other day to start a build thread. 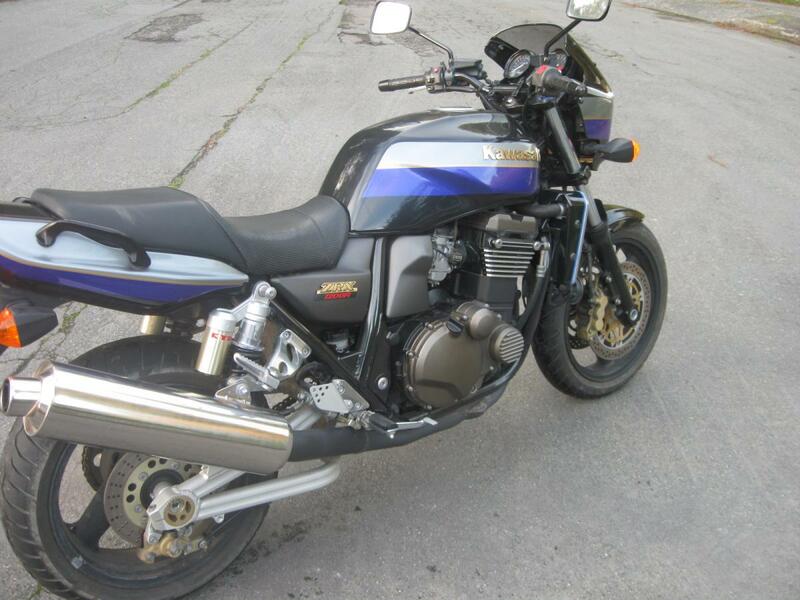 A little history - in order to afford getting a miata as a fun weekend car, I had to sell my motorcycle (it was a 2001 Kawasaki ZRX1200R). It was a sad day when I had to let it go, but honestly I know I made the right decision. I took the cash from the bike sale and went on the miata hunt. Originally I wanted a green NB, but given my budget I knew that wasn't likely to find one in good shape. 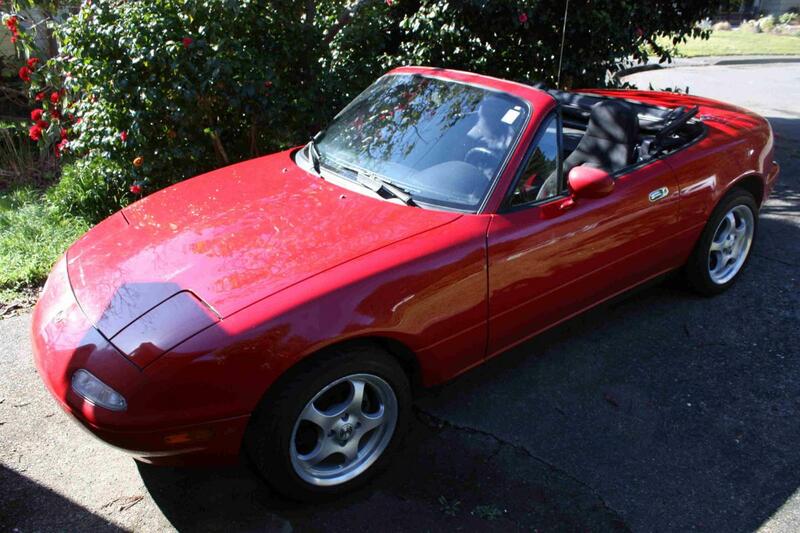 I ended up finding a red NA with a good ownership history and only 73k miles. My primary criteria was that it was a 1.8, was clean, and had no rust. This one fit the bill so it became mine. Also since it's a 1995, no OBDII is a bonus! Here's how it sat when I bought it. It still looks kind of plain but I prefer the sleeper car approach compared to the AEM and Jegs sticker look. Maybe I'll do some sort of racing stripe - not sure and it's not a priority right now. It handles great and is a blast to drive, but holy crap it is slow. 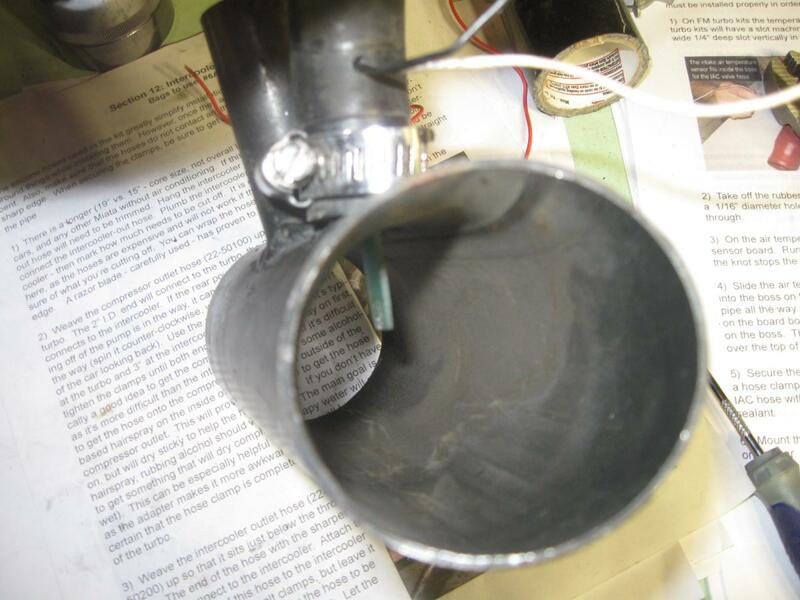 So after a lot of debating over various power pathways I decided to take on building a DIY turbo system. I just want to build something that's primarily streetable. I will do about three HPDEs a year with this car but it's mostly just for fun. My whp goal is 200-210. First, with the gracious help of thirdgen, I tested compression and leakdown of my engine and I was very comfortable with the results. In fact, let me pause here to thank thirdgen for the tremendous amount of help he's given me along the way. I probably would have been banned from this forum if I publicly asked some of the stupid stuff he's had to answer for me. Props, sir! 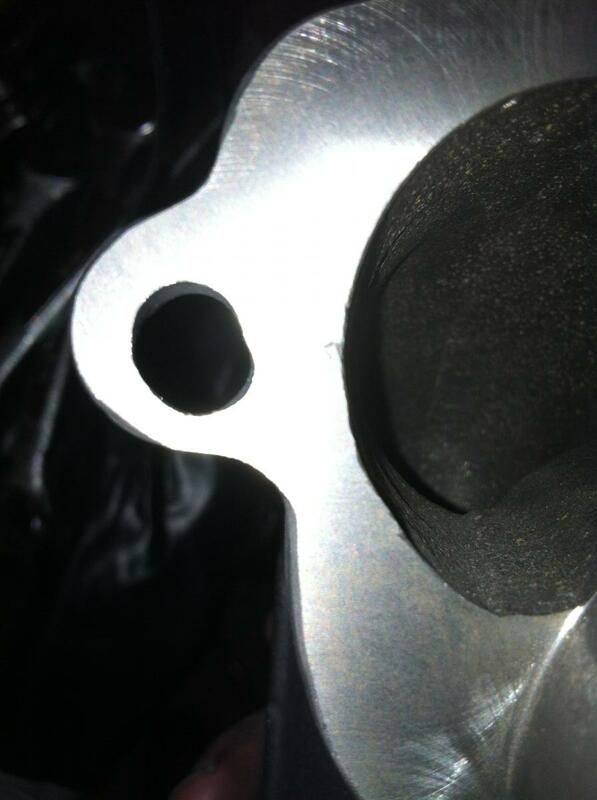 New FM cast manifold that had crooked M10 stud holes drilled in it. I got it cheap and took it to a machine shop to get the holes fixed and heli-coils installed. In addition to the above I've wired the gauges, installed the Link, tapped and installed the oil return line fitting, and drilled out all the bolts I've snapped during the disassembly process. I'm expecting a delivery soon with the cast outlet for the turbo and once I get that I can start making serious progress. 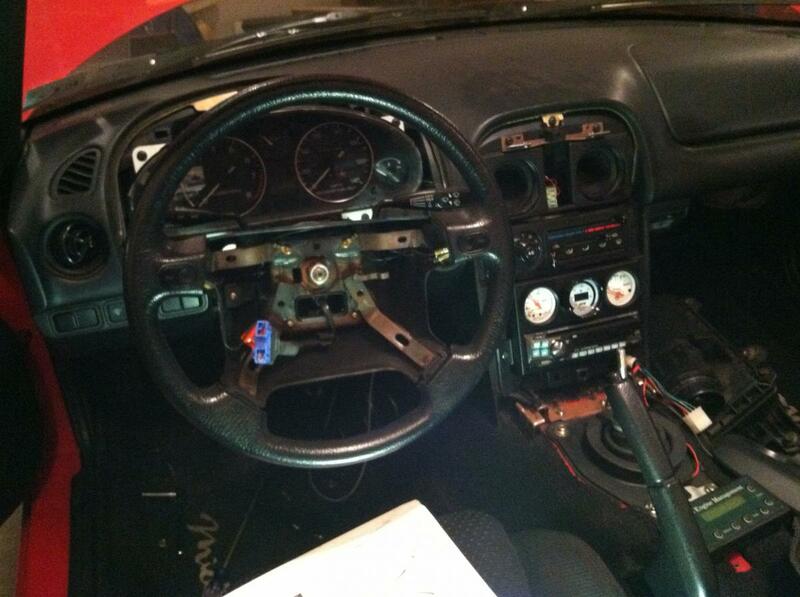 I'm not very good about taking a lot of photos, but here's one that shows how I'm mounting the gauges. Glad to see you starting your build thread! You didn't have those 6uls when we met on PCH, did you? I like 'em. My wife wants me to get black in 15x7 and I guess I'm just gonna have to oblige her. Looking forward to more pics! Hey Ray - no those were the old Borbets at the time. So your wife is encouraging you to get 6ULs? Very nice! I think the black ones would look great on your car. I'm looking forward to seeing your build progress too. Post it up! How do you like the Clearview Maxx? How does it do with a broomstick test? With stock seats, fail. I plan to do a little surgery on my seat bottom to remedy that at some point. Other than that I like it real well. At some point I would also like to move the rearview mirror down an inch or so because the cross braces are still blocking my rearview a bit in the upper corners. Stage 8 locking hardware does work on this turbo, but I did need to ever so slightly grind down a few of the retaining clips so they would fit down between the nut and the turbine housing. I found out my new cast outlet didn't have exactly the right pattern for the studs. I found this thread that proved to me it wasn't just me, so I got to work using a round file to shape the 5th hole as needed. It took some time but it worked out fine. Once I get the banjo fittings for the water lines done, I should be ready to mount this on the engine. I realize that the oil drain fitting is pointed the wrong direction but if it faced the other direction it would hit intercooler piping, and I think this orientation should work ok. Looking good sir. That's the newest-looking used turbo I've ever seen. Thanks. I went back and forth for a couple days deciding whether or not to rebuild the turbo myself or send it out to a place like G-Pop Shop. 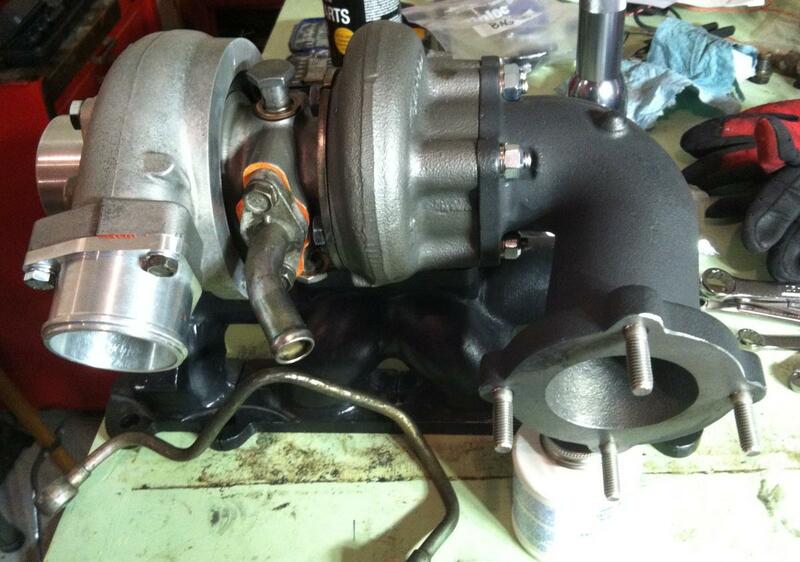 But I stumbled on some really good reviews of a guy in Greensburg, PA that has a little side business rebuilding journal bearing turbos for the DSM community. For about $100 more than the G-Pop Shop parts kit, he did the whole thing including media blasting the turbine and center housings and repainting them with high temp paint. You could cut that so it points straight down. I'm sure you could flare it even thought I'm not convinced you'd need too. Or you could cut it off completely and tap the flange. 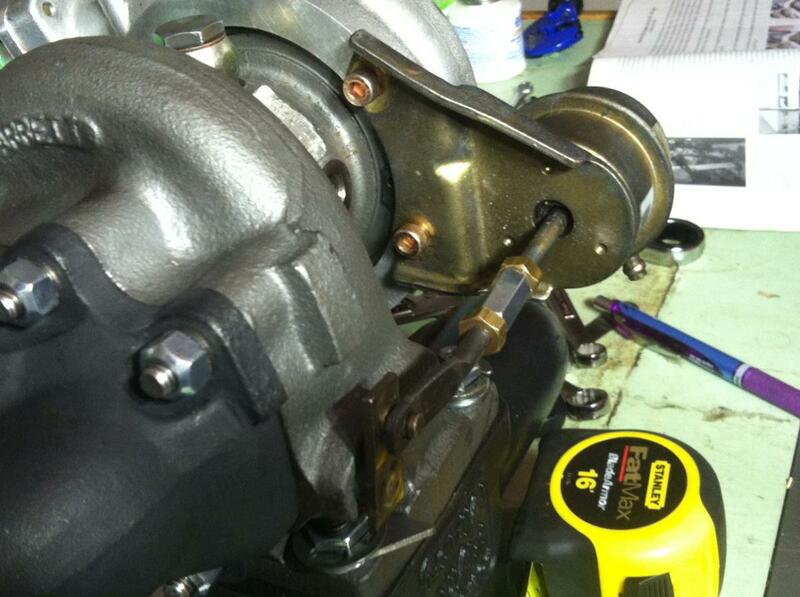 Or I have a 1/2" thick aluminum oil drain flange for a T25 turbo already tapped with a 1/2" pipe tap. You could have it. I'm sure I also have a spare 1/2" barbed hose connector. If you're using rubber hose. It looks like you're moving right along nicely. We'll have to meet up when you're finished and we can get on the dyno. Does your turbo man have interest in more work? I'm sure there are many out there who would be more than happy to utilize his services. Hey Patrick, I appreciate the offer and advice but I think for now I'm just going to see how it works as-is. It was the piece that came with the turbo from the Nissan forum and it fits the artech drain line I purchased perfectly. Yes, I'm thinking maybe we should even try (again) to plan an all PA meet. There seems to be a number of us around. I was actually emailing him about this. He said he's got lots of other work already but he certainly won't turn anyone away if they would like his service. No problem but if you need it or want a braided stainless line...I've got a bunch of spare stuff. 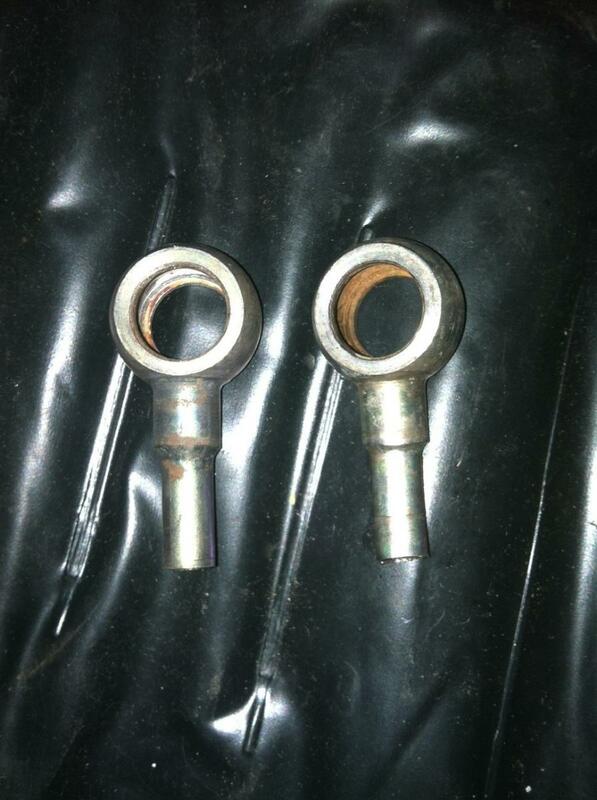 I sacrificed a stock sr20 water line in order to reuse the fittings on my build. One of them was a little rusty inside but cleaned up reasonably well. Lines installed. 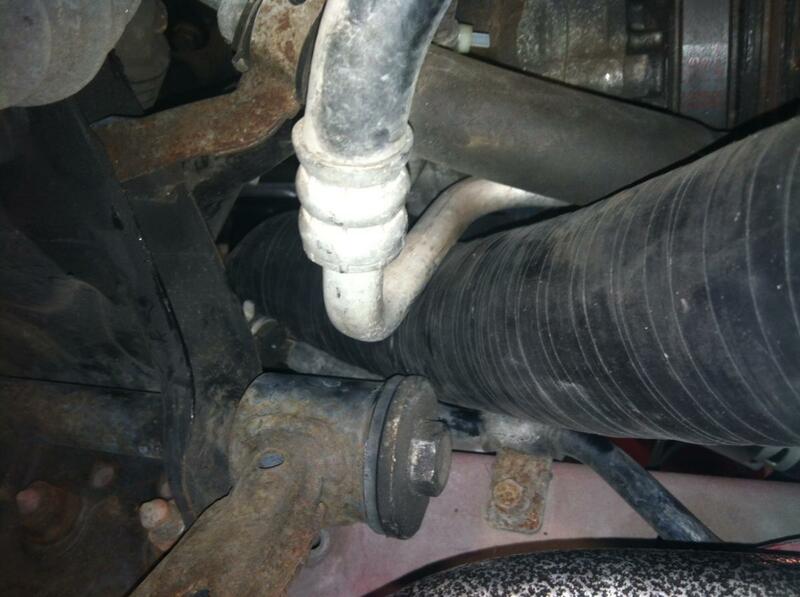 An extra large heat shield on the oil drain line hides the ugly worm clamp at the top. However, I thought using another clamp just snugged up around the bottom of the heat shield to hold it in place made sense. I couldn't fit this on the engine last night. I've heard that with this setup you do not need to bend or cut the frame rail, so I have not done that. I will try disconnecting one of the motor mounts and jacking the engine up a little to see if that gives me enough clearance. I'm not sure you'll be able to get it in all bolted together. Atleast not with the elbow on. 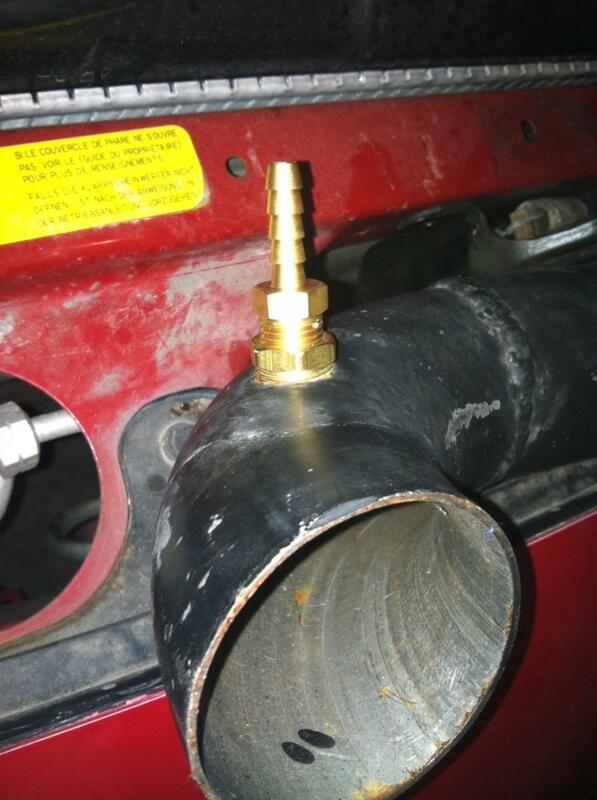 The manifold, turbo and outlet casing can be installed pre-assembled as shown above. 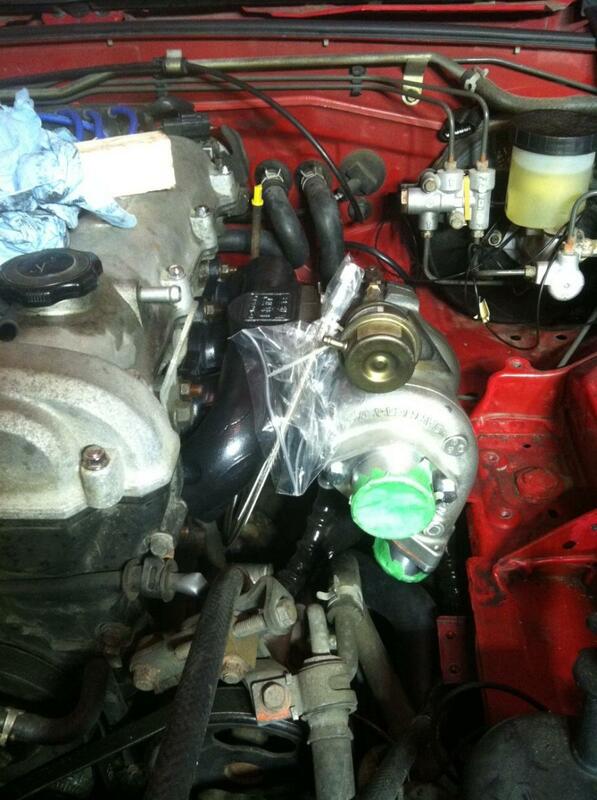 It is far easier than trying to install the outlet casting with the turbo in the engine bay. Even after loosening the motor mounts and jacking the engine up, I still need to cut a slot to get it to fit. I've seen quite a few threads on how people have dealt with mounting the wastegage actuator on an SR20 turbo after rotating the compressor housing about 180 degrees. I was very close to copying Curly's exhaust clamp solution (this is the copycat build after all) when I decided to do something else. Ended up drilling and tapping mounting holes in the back side of the housing, and then shortening and threading the stock actuator rod. 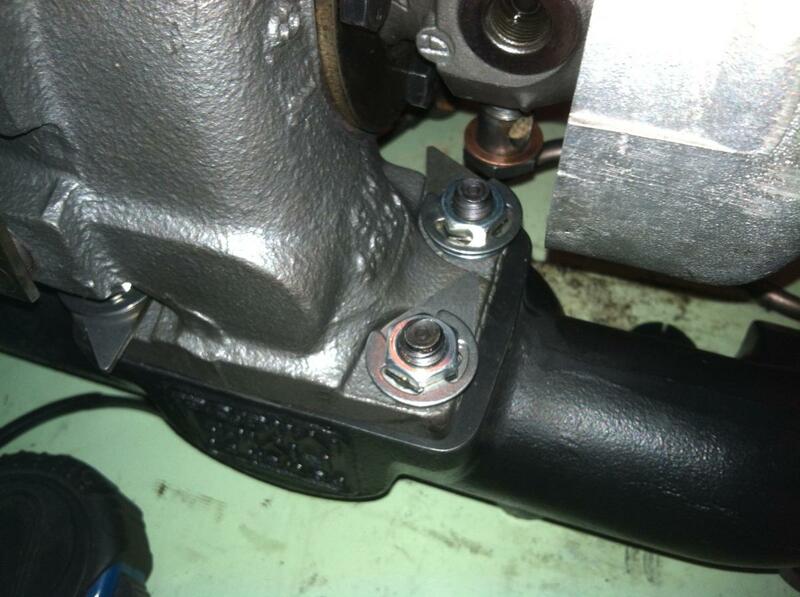 This way I could keep the actuator on the stock bracket and end result was very stout. That's genius! Where did you get that idea from? Thirdgen Turbo System Consulting, of course. Props! Made some reasonable progress this weekend. 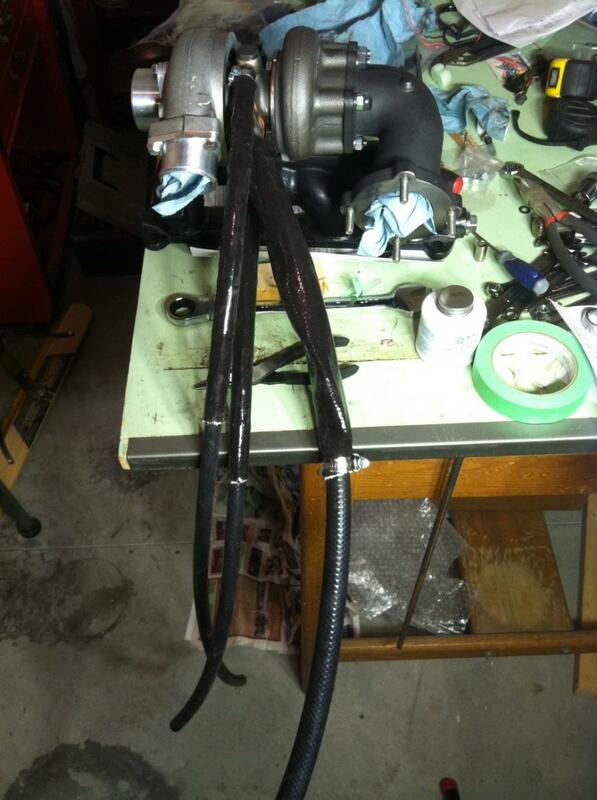 Got the oil and water lines hooked up and most of the intercooler piping set up. 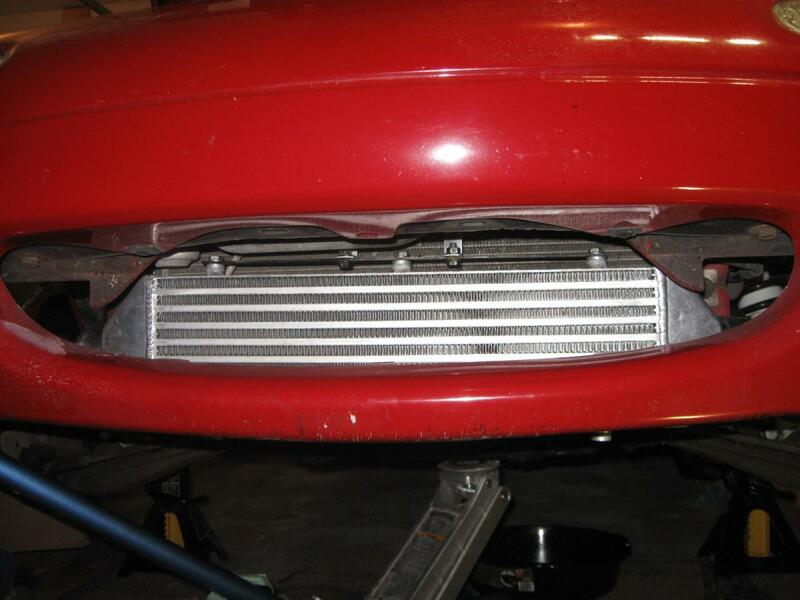 I need to get to a NAPA and pick up two more t-bolts and I'll be able to finish the intercooler piping. Major stuff left is to swap the injectors, hang the exhaust, and run remaining misc vacuum lines and gauge wires. Running the intercooler piping wasn't too bad, but keeping the A/C and power steering definitely makes my life more difficult. I picked up a used FM silicone pipe for the compressor-intercooler side, and it is a tight fit, and some protection for the pipe will be in order. 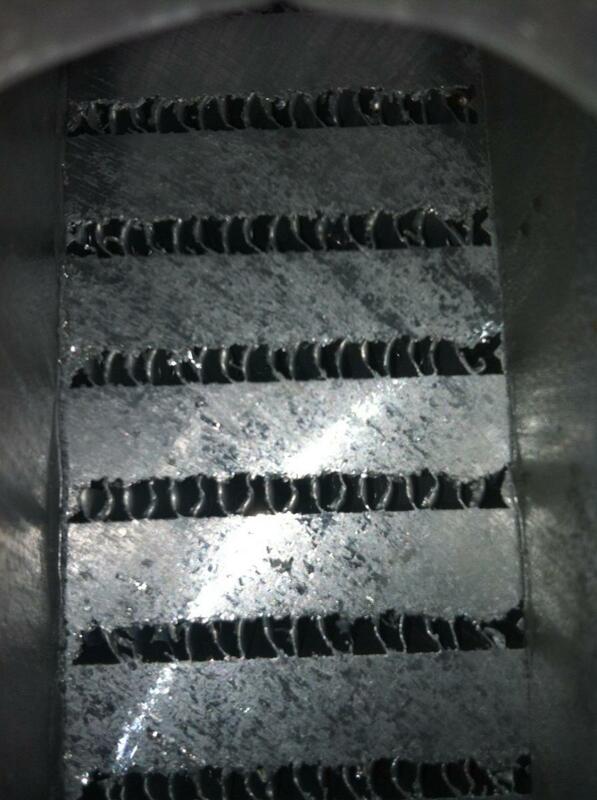 The intercooler-intake side was easier, and I'm using some metal tubing I picked up used off the forum. The guy before me was using a 3/8" hole for what I assume was his GM IAT sensor, but I adapted it for the wastegate signal source per Joe Perez's very helpful thread on boost sag. I was less than amused about the FM Link IAT setup. I picked up a used sensor and I just hope it's not already broken. 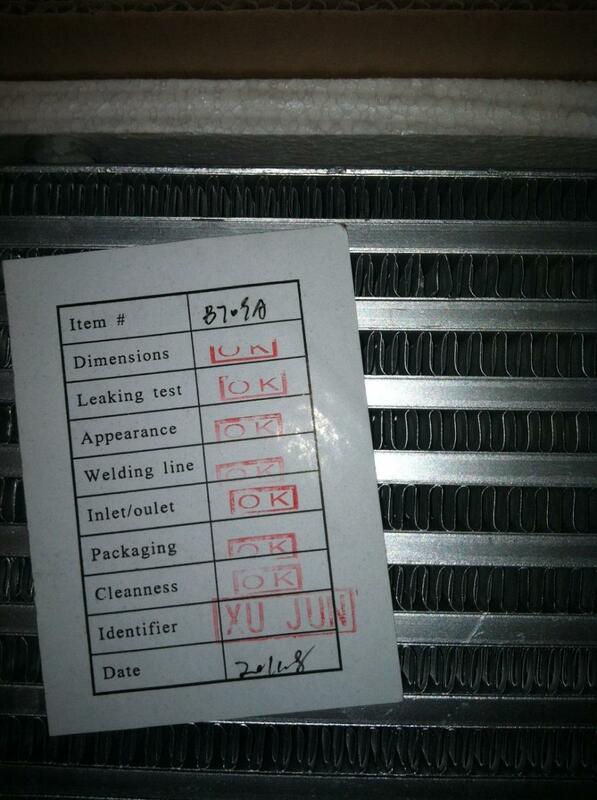 Now that I see this picture, the intercooler is crooked. 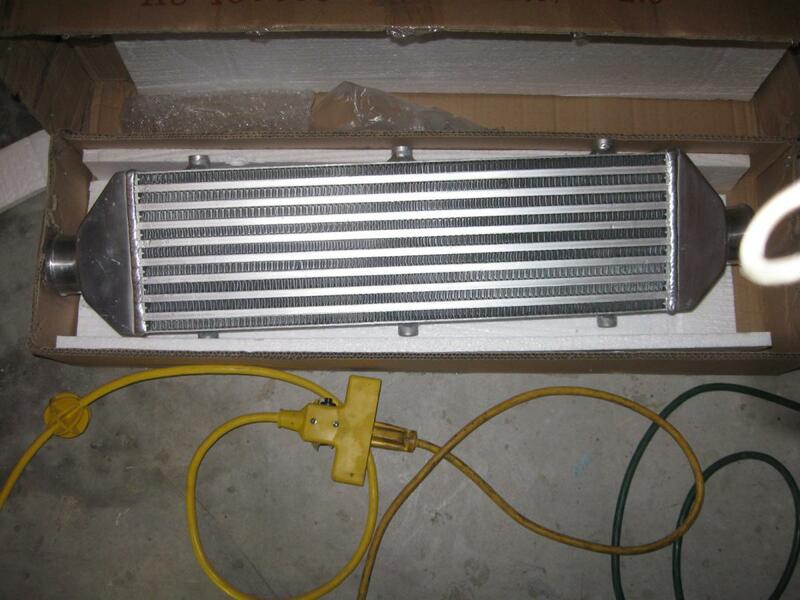 I bought some strips of aluminum and attempted to copy FM's intercooler hanger, but it will need some adjustment. 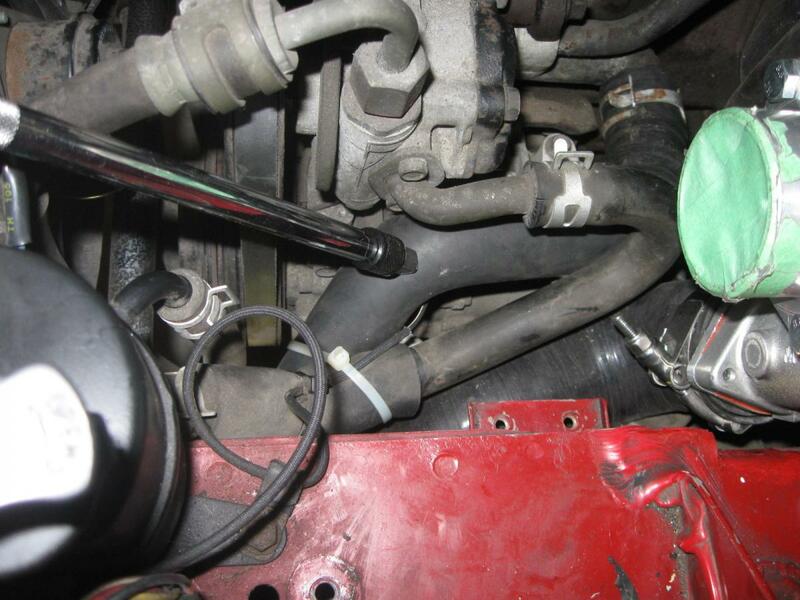 For the lower radiator hose, I saw some posts about using a universal 20" long NAPA hose, but I also saw some people with NAs had luck with using an stock NB hose. So I picked up an NB hose, but when I was installing it, it was way too long. In the end, I had to trim about 5.5" off the upper end and about 0.5" off the lower end to make it fit without kinks. Either way, I think it should work. With any luck, I'll be wrapping up this install this weekend.